Many of our clients ask us about setting up automatic payments to make managing their hosting and domain renewals simpler. This can be acheived by adding a default payment method to your Customer Account. Here's how to add or update your default payment info. Log into your Customer Account. If you aren't sure what your Customer Account is or how to access it, please read this article about How to Log Into Your Customer Account. 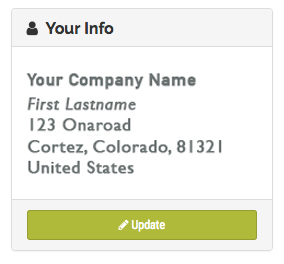 From your Customer Account dashboard, locate the 'Your Info' box in the top left corner of the screen. Click on the green 'Update' button at the bottom of the box. This will take you to the 'My Details' page. 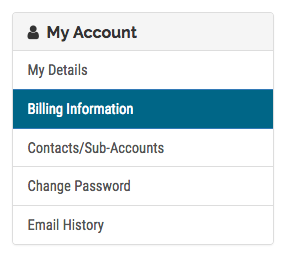 Next, click on 'Billing Information' in the My Account box on the left; the second option from the top. This will take you to the page where you can update your default payment info. You can update your current payment information on file, or add a new payment method here. With your default payment info updated in your Customer Account, payments will automatically be attempted the day before your invoice due date. Our system will notify you once the payment is complete.